As you travel from Alaska's interior toward its northern or western coast, you'll see a dramatic transition, as boreal forests of spruce, birch, aspen, and cottonwood disappear from the landscape. In place of forest, low shrubs, mosses, sedges, and lichens blanket the mountainsides and valleys. In flat areas such as the coastal plains, the landscape is dotted with small lakes, or divided into strange geometric patterns. The country feels grand and limitless stretching to the horizons of the broad sky. This is Alaska's arctic tundra. Arctic tundra is a landscape of amazing contrasts. View it from a distance, or visit in midwinter, and you might think it is barren. It's not. Though treeless and often bitter cold, Arctic tundra is an ecosystem of great beauty and abundance, shaped by the dramatic seasons of the far north. The word "tundra" (from the Finnish tunturi: "treeless heights") refers to treeless ecosystems where winters are long and cold, and summers are short and (usually) chilly. Those conditions are found both in the high latitudes (northern and southern), and also atop high mountains. High-latitude tundra is called arctic tundra or lowland tundra, and high-altitude tundra is called alpine tundra. The defining characteristic of tundra is the lack of trees. Scientists cannot point to a single factor that limits tree growth; rather it is a combination of factors: growing seasons that are too short for plants that produce wood, strong persistent winds that desiccate and abrade plant tissues, permafrost that prevents roots from reaching deeply enough into the soil to provide support, and cold soils that slow decomposition and nutrient cycling. One of the climatic conditions that give rise to tundra is cold air temperatures. But it's not just winter's cold that shapes this ecosystem. Rather, it's the chilly average temperatures which limit plant growth and encourage the formation of permafrost. Why is Alaska's arctic so cold? During our northern hemisphere winter, the arctic regions of the Earth, including Alaska, are tilted away from the sun, receiving less sunlight and thus less solar energy (warmth). In summer, even though the northern hemisphere tilts toward the sun and days are extremely long (see "Day Length"), the sun's energy arrives at a low angle, filtered through thick atmosphere. In Alaska's Arctic and near-Arctic, seasonal changes are dramatic. In midsummer, when the Earth's northern pole is tilted toward the sun, days are tremendously long-in fact, from the Arctic Circle north, the landscape can be bathed in sunlight 24 hours a day around the time of summer solstice. But as the Earth revolves around the sun towards winter, the pole tilts further and further from the sun; days shorten, and shorten-until midwinter, when, north of the Arctic Circle, there are days when the sun does not rise above the horizon at all. Alaska's tundra gets very little snow or rain-it's sometimes called a "cold desert." Annual precipitation at Barrow, located on the tundra-covered Coastal Plain, is around 4 inches-far less than annual rainfall of the Mojave Desert. 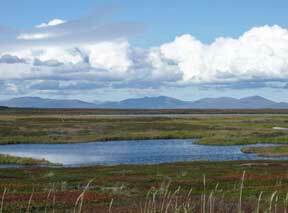 Despite the low rainfall, though, Alaska's tundra is rich in wetlands. This is because of permafrost, which acts as an impermeable layer under the thin tundra soil, trapping moisture close to the surface. These conditions make arctic tundra a complex mosaic of wet and dry sites. Tundra is also a windy place. The contrast in temperature between the land and the ocean creates persistent breezes that sweep across the treeless landscape. These winds can pose challenges for life: wind dries and chills, and can pick up dust, snow, and debris, scouring any exposed plant or animal tissue. Some tundra plants and animals are specially adapted to minimize wind damage. Some animals, however, actually seek out wind-scoured areas, where travel is easier and forage plants are more accessible.